INDEPENDENCE, Mo. — A class action lawsuit has been filed against the city of Independence over billing issues. 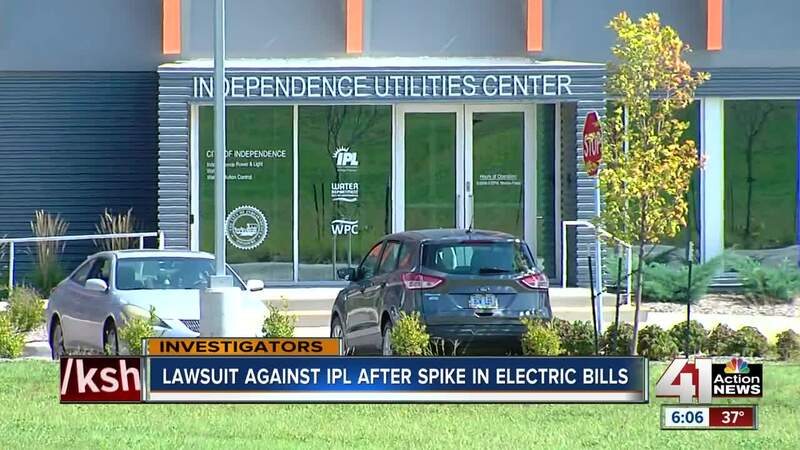 The lawsuit, filed Monday on behalf of Independence Power & Light customers, claims the city and IPL overcharged customers for their electricity consumption. The Accurso Law Firm filed the lawsuit, which also claims city officials and IPL failed to address customer concerns: "Customers are still receiving electric bills that are disproportionally high. After the new billing system came into effect, thousands of IPL customers have seen their electric bills increase dramatically. " Mayor Eileen Weir was served on behalf of the city and IPL, which switched to a new billing system in May. The 41 Action News investigators reached out to city spokeswoman Meg Lewis about the lawsuit's allegations. She said the city cannot comment on pending litigation. Andy Boatright, former director of IPL, is also listed as a defendant in the lawsuit. He said he wasn't aware of the lawsuit when reached by 41 Action News. After being provided a copy of the lawsuit, 41 Action News asked for comment, but Boatright has yet to respond. IPL has 56,000 customers, nearly one-third of which have past due accounts, according to Zach Walker, city manager for Independence. Residents have complained about increasing utility bills since last spring when the billing system changed. Lucy Young, a former Independence city council member, said her rates were so high in the summer she couldn't afford to run central air. "I have a flannel sheet and blankets in all my windows," Young told 41 Action News in August. "I shut all the vents. I shut all the registers. I shut the doors. I sleep downstairs so that it's cooler and takes less utilities and I keep my thermostat at 81." Young said she felt fortunate because she receives Social Security payments that help her get by, but she worries everyone isn't getting the help they need. "I'm not the only one doing this," Young said. "What's really upsetting to me are the people that don't have Social Security to depend on." Some city council members expressed concern last month about decisions being made on behalf of city leaders that they believe also have a negative impact on utility rates. Last year, a majority of the city council hired a company to buy, demolish and remediate the city's old power plant, located in Missouri City. Weir, council members Curt Dougherty, Tom Van Camp, John Perkins and Chris Whiting all voted to select the high-bidder for the job, a decision that didn't sit well with council members Karen DeLuccie and Scott Roberson, who voted against hiring the more expensive company. "To this day, I do not understand that decision, because that was not a good business decision," DeLuccie said. The selected company bid the project at $8.9 million dollars. Records from the city show another company offered to do the work for half the price. The final contract eventually was awarded to the higher bidder for an estimated cost of $9.7 million. "I honestly do not know why that decision was made," Roberson said. "There was no reason for us to spend any money. (The Environmental Protection Agency) was not requiring us to do anything." A previous 41 Action News investigation revealed discussions about the deal took place behind closed doors between city leaders and a man who several years ago went to prison for bribing a city councilman, which raises even more concerns for DeLuccie. "I don't doubt for a minute there's something going on," DeLuccie said. Garland Land, who serves on the city's Public Utility Advisory Board and also has criticized the deal, said decisions like the Missouri City demolition deal have a direct impact on utility rates. The city used funds from IPL to pay for the project. "They awarded the contract to the high bidder, which was twice as much, about $5 million more than the low bidder," Land said. "We could not find the basis for making that decision." The lawsuit also lists CONSTELLATIONS SOFTWARE, N. Harris Computer Corporation and Advanced Utility Systems as defendants. According to the petition, "Similar issues have occurred in other jurisdictions with N. Harris Computer Corporation and Advanced Utility Systems." Walker said the city is currently cutting off power to businesses that are delinquent on their utility payments. The city will begin to cut off power to residents after Christmas. However, Walker said the city has a "cold weather rule," which means the city will not shut of utilities for residents when temperatures are below 32 degrees. Young said city leaders must find a way to help residents. "We don't want a handout, we want a hand up," Young said. "By God, the city manager, IPL, they need to look at us as human beings."